Q. What are the advantages of staying at The Madison rather than a hotel? A. We provide a hotel-like amenity but with the privacy of an apartment. Further, our standard unit includes kitchen facilities that most hotel rooms do not. Q. What is included in your Standard Monthly Rates? A. We offer two different rate plans that our guests can select from. We also provide additional services on an optional, or selected basis. Visit our Rates page to learn more. Q. I have reviewed your Standard Monthly Rates, and unfortunately, it appears they may be out of my budget range. 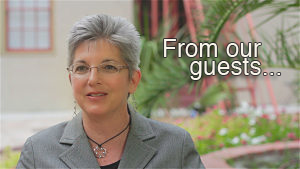 Will you "price match" other fully furnished venues in the San Antonio area? A. First, have you considered booking a unit on our Furnished Condo rate schedule? If so, and we are still out of your budget, provide us a proposal based on the other options that you may be considering. 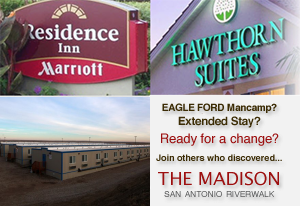 Please understand that much of the San Antonio furnished housing market is currently maintaining high rates of occupancy due to the impact of the EAGLE FORD shale find (a huge oil & gas project approx. 30 minutes south of town), the US military's METC (Medical Educational Training Center) program at Fort Sam Houston, and the business growth represented by the Kelly Railport -- just to name a few recent "growth" factors affecting our guest traffic. However, our property, like others, is not always 100% occupied, in which case we will definitely consider any reasonable offer subject to availability. A. Depending upon the unit type, the kitchens are fully equipped with a coffeemaker, refrigerator, full-height oven/stove (the Studio units have countertop, mini-convection ovens & hotplates), and microwave oven. All dishware, flatware, and cooking accessories are provided. Bedrooms and baths are supplied with linens and towels. There is also a broadband internet connection, flat panel LCD television(s), blow dryer, iron and ironing board. Visit our Amenities and Rates pages to learn more. A. Yes, there are both ensuite and also community laundry facilities onsite, depending upon the unit type. A. For guests renting on the Serviced Apartment rate plan, housekeeping is undertaken two times per month (middle and end) of your stay with us and is included at no additional charge. Should you desire more frequent housekeeping service, let us know and we can discuss your needs to see how we can best accommodate you. One thing is certain, our housekeeping is remarkable and will exceed your expectations! A. We accept pets on a selective basis. A non-refundable pet deposit of $350.00 - $750.00 per pet applies, the level is dependent upon the breed/size of the pet, the specific unit involved, the length of your stay, and the manner in which the pet will be cared for during your daily absences (i.e. portable kennel, offsite daycare, etc.). A. Move-in time is 3pm or later. Move-out time is 11am. If you need to make special arrangements, just let us know by calling Guest Services at 210.544.5416, x202. A. We accept cash, a personal check, wire transfer, money order, e-Check or EFT, along with most major credit cards such as American Express, VISA, and MasterCard. Corporate accounts may establish direct billing procedures. Note that credit cards and Paypal payment options will have an additional 5% convenience fee added to the monthly rental charges to cover our processing costs. A. Yes, there is ample, FREE parking on the street in front of our buildings which is available on a first come, first served basis. A. The Madison's guests have access to a professional fitness facility (including a swimming pool) that is conveniently located just around the corner from our property. It is available on a 'members only' basis, 24/7. Monthly member fees are included with our Serviced Apartment rate plan's amenity package, and are an optional, additional monthly fee (currently $35./mo. ), for guests choosing our Furnished Condo rate plan. See Facilities to learn more about this marvelous fitness venue. A. Call us at +1.210.544.5416. You can also contact us by email and request that we forward our booking forms. Once we receive the executed forms and the first month rental amount, we take the unit off of our 'available' list to ensure that it will be ready when you arrive.